I think we can all agree that an air compressor and an airless paint gun are one of the most important devices for every homeowner. They’re convenient, helpful, and easily get the job done. Still, you may think that buying an electric airless paint sprayer is hard, but we’re going to show you it’s quite easy. Why is this so important? Well, simply because air compressors can help you in several ways around your house. They’re convenient and will make a big difference to your painting game. 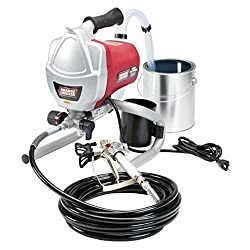 This is exactly why we’re going to tell you about the best airless paint sprayers of 2019 and review them. Buying spray guns and automotive painters is definitely something you should consider. When looking for an airless paint sprayer, you should first compare some of the best on the market. Among other things, a good airless spray gun is portable and easy to use. Naturally, when you’re looking to buy one of the best airless paint sprayers, you want to make sure that you know everything about the models you are considering. For this reason, check out the comparison table of the top 10 airless paint sprayers available in 2019. As you can see, there are some bigger and some smaller differences when it comes to each airless spray gun. Of course, one airless paint sprayer may be better for a homeowner while another is more suitable for a painting contractor. Either way, there should be at least one model suitable for your specific needs. For example, the Magnum X5 by the well-known company Graco is a great airless paint sprayer by that works wonderfully for most households. On the other hand, the Magnum ProX9 will work far better if you’re a small painting contractor. if you still can’t decide which one is the best for you based on our comparison chart, learn more by reading the reviews we’ve prepared for each of these models. This is one of the most popular models if you’re looking for an airless paint sprayer to use around your house. It not only supports from 1-5 gallons of paint, it’s also powerful and easy to use. Thanks to its Demand Delivery System, this sprayer’s powerful universal motor runs only when you trigger the spray gun, saving on energy costs. The Magnum X5 airless paint sprayer is also lightweight, featuring a portable stand design. It features a 6 ft. long cord to help you get to those hard to reach areas. Finally, its PushPrime feature prevents this airless paint sprayer from losing pressure. One of our favorite things about this airless spray gun is its flexible suction tube. The tube allows you to spray directly from any paint bucket up to 5 gallons. In addition, the airless paint sprayer has a RAC IV switch tip that’s one of the most convenient features a compressor can have as it allows you to reverse the tip and continue spraying whenever it clogs. 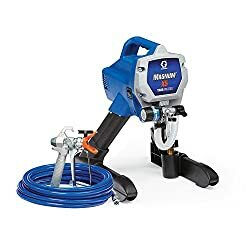 Finally, the Graco X5 comes with a PowerFlush adapter that you can connect to a garden hose in order to clean up quickly and easily. This electric airless spray gun is the most popular with homeowners and handymen alike. This is largely due to the fact that the pressure control lets you fully adjust the pressure using according to the painting project. The airless paint sprayer allows you to use up to 125 gallons of paint per year. Another really great capability is that you can spray the paint unthinned thanks to its stainless steel piston pump. 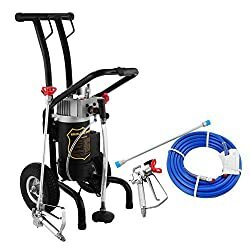 Finally, this electric airless paint sprayer supports 75 ft. of paint hose which easily allows you to reach just about anywhere you might need to. The tip size is only .015 in. This X7 model is another great electric airless paint sprayer by Graco. We’re talking about a compressor you can use as a homeowner, as a professional painter, and for property maintenance. This airless paint sprayer features a stainless steel piston pump that makes spray painting unthinned paint quite easy. It includes a cart with a hose rack with a convenient 100 ft capacity and wheels to provide portability. It also comes with a PowerPlug Illuminating cord end, as well as a 6ft long cord. This airless paint gun features a powerful universal motor with a Demand Delivery System. 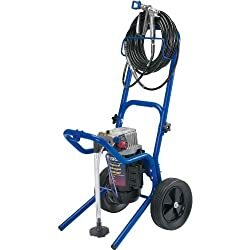 Just like the previous Graco model, this electric airless paint sprayer features a flexible suction tube that helps you spray from a any bucket with 1-5 gallon capacity. The ample 100 ft. of paint hose allows you to spray distant and hard to reach areas. For example, if you needed to paint a second and third story, you’d find this compressor convenient and helpful. If your hose is clogged, you can easily reverse the tip in order to keep spraying thanks to the RAC IV SwitchTip. 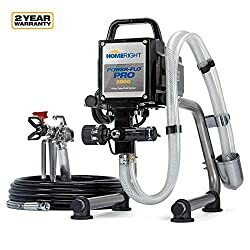 Finally, one of the best features of this compressor is the PowerFlush adapter that allows you to easily and quickly clean it by connecting it to a garden hose. This airless paint sprayer has fully adjustable pressure to insure that you have total control of paint flow no matter what project you are doing. Graco recommends you use up to 125 gallons per year, which is quite a lot for a homeowner-type of compressor. It’s also easy to avoid any priming problems, clogs, and bad clean-up thanks to the AutoPrime feature. The compressor allows you the max flow rate of 0.31 gpm (gallons per minute). This model is great for automotive painting, exterior patios, fences, interior surfaces, decks, and more. One of the most versatile compressors, this model is fit for coating many different surfaces. It’s 900W motor power makes this electric airless paint sprayer quite powerful. This motor is single phase and reliable when operating at high speeds. Naturally, this will allow you to complete larger projects within a shorter amount of time. The compressor features a max pressure of 200Bar and an operating pressure of 22Mpa. 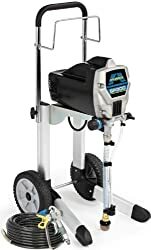 Based on this, you can see that this airless paint sprayer features a powerful motor and a small diaphragm high-pressure pump. This compressor is suitable for homeowners, handymen, property maintenance, general contractors, and others. Naturally, when you think of extra features, you want to know about the nozzle diameter, spray tip, and other crucial details. Luckily, this compressor is packed with all the extra features you need. It’s nozzle’s diameter is 0.11-0.39mm while the input pipe diameter is 58cm. As we’ve mentioned, its max pressure is 200Bar which is supported through 50 ft of high pressure hose. Its spray tip is 0.017’’ and the support max tip is 0.079’’. This compressor features a 60cm incl. filtration system, located in the suction hose. Finally, the chassis featured is made of metal, featuring 88mm wide tires. Thanks to its features, details, and spraying capabilities, an airless paint sprayer like this is suitable for many different projects. One of the things that makes this compressor so good is the .093gpm paint flow capability. This is a remarkable level of paint flow that allows you to paint spray medium and large areas like house exteriors and interiors. This airless paint sprayer is suitable for the high viscosity of latex paint, colorant varnish, oleo resinous coatings, epoxy, chlorinated rubber, and other applications. You can also use it for tile painting, anti-corrosion of metal, refurbishment, and more. If you’re tired of using a roller and a brush to paint the exterior of your house, consider this compressor for spray painting. Honestly, we all know that painting a house would take days if you were using only a brush. However, this compressor allows you to complete the task in significantly less time. 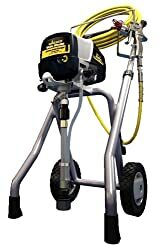 The airless paint sprayer features 2800 Psi, as well as a 1/2 HP motor. This motor has strong legs, so the machine has all the stability you need while spraying. It’s a great device if you’re someone who’s looking to use their airless paint sprayer often and for large areas. One of the best features of this airless paint sprayer is its 515 spray tip. This reversible spray tip is crucial in order to clean clogs quickly and easily. Also, it’s important to mention that this device features a non-stick ceramic inlet valve that’s wear resistant which is very important to its durability and longevity. As you might expect, the airless paint sprayer features a hose and a swivel for its spray gun. Naturally, it all comes down to the product’s paint spraying capabilities. When it comes to this compressor, there are a few details worth mentioning. First, its maximum paint capacity is .24 gallons or .908 liters in a single minute. Impressive, don’t you think? This kind of paint flow allows you to paint larger areas quickly instead of taking an entire day to paint with a roller or a brush. It’s pretty clear that you won’t need a painting contractor if you choose to invest in this compressor. 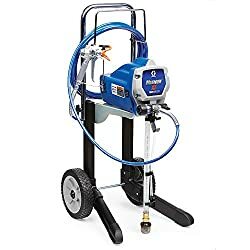 Finally, here is an American-made two-gun airless paint sprayer that doesn’t require a compressor. It’s a good choice if you’re looking for a device that can paint both the inside and outside of your house. Its design is compact, and it features pneumatic tires that provide easy transportation and also protect your floors if you’re using it inside of a house. You’ll be able to do both thin, light layers, as well as heavy coatings thanks to its professional metal spray gun. An added bonus comes from the manufacturer who offers a lifetime warranty on both pump and motor. Normally, paint sprayers come with a set of features that make one model different from the other. In this case, the Campbell Hausfeld comes with a 50 ft. high-pressure hose though we feel its important to mention that the device can handle a hose up to 200 ft. long. This spray gun has a max tip size of 0.015-0.019 inches. All of these features make one good airless paint sprayer that will allow you to paint easily and in no time. Since this device features two guns, you can already see its advantage when compared to other popular models on the market. However, it’s also important to note that the diagram pump is 1 HP, and that it sprays about 0.44 gpm at 3000 Psi. Its great painting capabilities make this airless paint sprayer one of the best. With an airless paint sprayer like this, you won’t have any problem spraying even a unthinned, thick, latex paint sprayer. Because of its paint flow and the pressure, you’ll find this airless paint sprayer worth all the attention it’s getting. If you have any experience in paint spraying, you’ve probably heard of Krause & Becker. This company makes one of the best airless paint sprayers for homeowners. One of the most important details about this device is that it’s easy to clean, maneuver, and use. It features a powerful piston pump that provides high pressure. The pump also allows you to achieve better coverage whenever you want it. Its nozzle is number 517 made for an 12-16 inch wide fan. It’s worth mentioning that this compressor is lightweight and easily portable. You’ll also find it noteworthy that it won’t rust or corrode. Its spray gun features a built-in filter. Naturally, you’re probably concerned about how to clean the machine. That’s not a problem in this case because the device features a trigger lock that helps flush and clean easily. Finally, we found that this compressor is durable, definitely something important for a tool you are going to invest money in. Did we mention the high pressure you’ll get out of its piston pump? The piston pump features 1000-3000 Psi which provides enough coverage and pressure for small or big projects. Like other sprayers, this airless paint sprayer also pumps from buckets with 1-5 gallons of capacity. This kind of pressure, as well as its capacity make the paint sprayer one of the most popular among users. This product is a good choice regardless of what kind of surface you’re painting. There isn’t much we need to say about this compressor as its quality definitely speaks for itself. If you’re a maintenance professional, beginner, handyman or DIY-er, this is the right airless paint sprayer for you. Simply said, it’s a good device for anyone who’s looking for significant performance and capacity. It comes with a 4-finger metal gun, a swivel, and an in-line paint filter. Its motor is 5/8 HP, allowing you to paint larger areas in less time. It’s important to note that this airless paint sprayer is 1000-3000 Psi and it supports up to .017 maximum tip. We’ve mentioned the GS-07’s four-finger metal gun, its swivel, and its in-line paint filter. 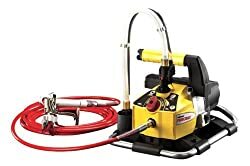 However, this airless paint sprayer also comes with a 35’ hose with an abrasion resistant polyurethane cover with an inner tube made from seamless thermoplastic. Also, the cart are 5-gallon bracket, with a telescoping handle. Another important feature to mention is its QuickFlo valve as well as its auto-lube pump attendant. The tip is a reversible 515/211 VersaTip that allows you to paint spray large and small areas with the same tip. Finally, the cart features 8-inch wheels that allow you to transport the machine easily and quickly. Since we’re talking about a commercial grade spray gun, we need to talk about its spraying capabilities. 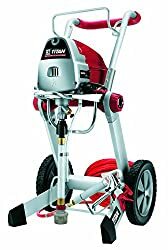 First thing you should know is that you’ll be able to do both interior and exterior jobs with this airless paint sprayer thanks to a powerful motor that can spray .33 gallons per minute . Naturally, this means you’ll be able to do large jobs quickly. Painting your garage, fence, deck, awning, barn, lawn furniture, etc. are all possible with this product. It’s also capable of painting on different types of surfaces such as metal, wood, and even stucco. This Titan model is one of the most popular models among maintenance departments and property managers. This is probably because its large capacity and significant performance rank this sprayer high among professionals. This good-quality airless paint sprayer is perfect for both small and large projects. It’s a powerful machine thanks to its 5/8 HP motor. It also features a smart-move cart that is collapsible for easier portability and storage. There isn’t much to say about extra features that come with this device. It is a very straightforward product featuring a gun, hose, smart-move cart, and a maximum tip size of 017. As mentioned, this is one of the most popular paint sprayers thanks to its features, details, and spraying capabilities. You’ll be able to paint all kinds of surfaces quickly and easily. It’s important to know that this paint sprayer doesn’t cause much overspray, so you’ll do fine even if you’re a beginner. Even so, you’ll find that the machine works even better in the hands of those who have at least a little bit of spraying experience. If you don’t like thinning your paint or your projects require a thick latex paint, this Wagner paint sprayer is perfect for you. It’s able to spray the thickest paints at .24 gallons per minute, made possible by its 2800 Psi piston pump and 1/2 HP motor. What’s really great about this device is that it delivers a professional paint finish but with homeowner sprayer features. The piston pump, along with the siphon tube, allows you to pump both thick and thin paints. We feel that this product’s most important feature is its adjustable pressure control. This is really important if there’s a spray gun swivel to insure comfort. This machine is very easy to use because it also features an auto lube attendant. All you have to do is put the inlet hose in place and attach the pressure hose and gun. For quick and easy clean-up, you can attach a garden hose to the inlet in to flush it out which shouldn’t take you more than 10 minutes with this product. Additionally, the machine features a 25’ high-pressure hose, metal spray gun, and a 515 spray tip. As we said, this airless paint sprayer allows you to paint with .24 gallons per minute. This means you’ll be able to do projects of all different types and sizes. For example, you can paint everything from your house, deck, garage, fence, barn, to lattice work and more. Its spray gun, pressure hose, as well as a 2800 Psi piston pump, makes this airless paint sprayer one of the most popular paint sprayers. If you’re a beginner, there’s no better paint sprayer for you than this one. Made especially for the those with beginner level experience, this Airlessco Electric paint sprayer is easy to use and easy to get used to. Its piston pump is lightweight and compact, making it easy to move around and transport. It features pressure control that’s easy to use which is very important when it comes to selecting operating modes. This sprayer is ideal for homeowners who want to paint their own house or are looking to use the device only now and then. It’s important, though, to keep in mind the size of your house as this device is only good for small to medium houses. Even though this is mainly an airless paint sprayer best suited to homeowners, it still comes with impressive and useful features. For example, its InstaClean pump filter prevents debris, reduces tip plugs, and provides a fine finish. Its pressure control features user-friendly symbols that make the device even easier to use. Another amazing addition is the power roller attachment which you can add any time you need more versatility. Spray anything from interior to exterior, using any paint you like--it handles anything from 100% acrylics, varnish, stain, and any kind of paint with a max output of 0.34 GPM. Whether you prefer oil or water based coatings, this compressor can make it happen. It pumps directly from 1-5 gallon container and has a capacity of 500 gallons per year, quite a lot for a paint sprayer made for home use. Many people may not know what a paint sprayer is, even though it’s a useful device for professionals and homeowners. To help clarify, an airless paint sprayer is a high-pressure device that sprays paint through a hose and small hole in the tip of a spray gun. The high pressure we’re talking about is usually up to 3000 Psi. Its tip helps breaks up the paint evenly in order to get that fan-shaped pattern. A paint sprayer allows you to quickly do all the painting you’d usually take a long time to do. Think about painting your house or a fence with a roller or a brush. Of course, it would be a boring and take a really long time, and we’re sure you don’t want that. With an airless paint sprayer, you can do all kinds of projects, small and big. There are different models, with different capacities and features to fit everyone’s needs. When looking to buy a compressor, it’s important to take a close look at the details. As you could see, every review above includes product details because they’re crucial to helping you make a decision. What are product details? In the case of this product, the motor is the most important detail. Next, you should consider the pressure control, the cart, as well as the pump and gun of the airless paint sprayer. The cart is important because it provides ease of transport, stability, and portability. The pump and guns are crucial because we wouldn’t be able to paint without them. Make sure you know which pump is included with each product, as well as all the details about the gun. Most of the top airless paint sprayers have very similar features, but there are some minor differences here and there. For example, most of them feature a cleaning system, but they aren’t all the same. Also, look for extra features such as the ability to add a garden hose. Look at all the extra features and consider whether they match what you’re looking for. Does the device have a reversible tip? Does it have a swivel? All of these features can make a difference in the performance and overall experience. However, keep in mind your experience level. You may not need some of these features if you’re only looking to paint your house now and then. Keep in mind that if you’re looking for a cheap airless spray gun, you may be limited to a sprayer with just a few basic features. Every review above shows you each product’s spraying capabilities. We’ve decided to include this information because it’s essential to picking the right airless paint sprayer. Because we’re talking about paint sprayers, their spraying capabilities may be the most important thing. Part of that means looking at the product’s paint flow (gallons per minute). Also, note at which pressure that it sprays, as well as the maximum tip size. Finally, pay attention to what kind of paint you can use and if the device is suitable for larger projects. Of course, consider what features, details, and spraying capabilities you’d prefer to have in your paint sprayer. Naturally, when it comes to automotive painting, things may seem easier than they really are. This is why it’s important to consider all of that carefully. Of course, the tip can clog occasionally. Although this is an issue, it isn’t something unfixable. Logically, it happens more often if you use very thick paint. In order to fix the issue, remove the clogged part from the device and wash it out. Sometimes you may have to replace the part. However, if you have a reversible tip, all you have to do is turn it upside down and spray the paint on low setting. Most of the time, this means there isn’t enough pressure. Additionally, a worn out tip often causes low pressure. On the other hand, you may have the device on a low-pressure setting, so make sure to check that right off the bat. If this is the case, simply increase the pressure. If not, replace the tip. Sometimes, a spray nozzle that’s too small for the paint can cause the motor to overheat. To prevent this, simply lower the pressure and replace your nozzle with a bigger one. In this case, there could be hardened or frozen paint in your gun. If this happens, you’ll have to replace the pump packings or leave the gun at room temperature . Unfortunately, you might need to replace your spray gun. Are you interested in other options? check our reviews about best HVLP paint sprayer in the market today. Hopefully, you found our list of top 10 airless paint sprayers helpful. If you’re looking to make painting easier, regardless of the project size, airless paint sprayers are the way to go. Of course, looking for a cheap airless spray gun isn’t that hard, but finding the best quality paint sprayer takes a bit more work. We made sure to include different types of paint sprayers that would fit a variety of different painting needs. What do you think about paint spraying? Have you tried any of these paint sprayers? What’s your experience with automotive painting? Please, feel free to join the discussion in the comment section bellow.